If Cato, Cicero, or Julius Caesar were here today, they would recognize the danger posed by Citizens United. 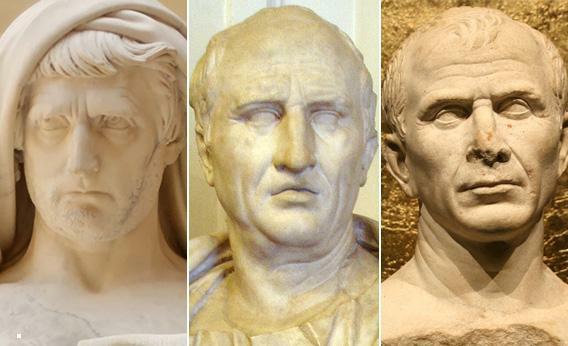 Roman luminaries Cato, Cicero, and Caesar. That line lasts because it’s a testable prediction. It’s not a question of precedent or constitutional interpretation, but of public opinion—and as such, we all feel competent to judge it. Loss of faith, the Supreme Court allowed, is itself an argument against our increasingly unregulated campaign spending regime. Of course, democratic faith is a slippery concept. But it is always on display in an election’s aftermath. In the best case, the election’s winners and losers have a shared, if grudging, agreement about the fairness of the process and its outcome. In the worst case, the winner’s legitimacy is just one more “fact” to disagree about. Does massive campaign spending move us closer to the worst case? One view of the 2012 election holds that super PACs proved far less effective than feared. “But ultimately,” argues Nicholas Confessore in the New York Times, “Mr. Obama did not beat the super PACs; he joined them.” His re-election, therefore, doesn’t settle the question raised by the Supreme Court; it simply postpones it. Rather than letting the Citizens United experiment in confidence play out over the next several elections, we can find evidence now, by looking to political history. How has the “appearance of influence” affected faith in other elected governments? History tells us that such faith is far easier to tear down than to rebuild. And one of the best examples of this faith under strain comes from one of the earliest experiments in elected government: the Roman Republic. Our political culture is saturated with historical appeals to the founders, but when the founders themselves wanted to make such appeals, they turned overwhelmingly to Rome. As inspiration and as practical example, that republic’s history is written into our own. For Alexander Hamilton, the republic represented “the utmost height of human greatness.” The authors of the Federalist Papers cited the republic as an influence on the American Constitution 14 separate times. In early America, Rome before Caesar served as the quintessential republic of virtue; its collapse was the ultimate cautionary tale of political corruption. A crucial part of that story was the corrosive influence of money in politics. To be sure, Rome was never a true democracy; its elections were always designed to heavily favor the wealthy and well-born. Further, the kind of money that consumed Roman politics—personal spending by wealthy candidates—isn’t the prime source of controversy in our time. Nevertheless, the last generation of the Republic’s politics was dominated by two trends: universal complaints about money’s corrupting effect on politics and near universal unwillingness to do anything about it. Ancient politicians were just as skilled as modern ones at identifying and exploiting loopholes in election law. In Rome, the key loophole lay in the fuzzy distinction between ambitus (electoral bribery) and mere benignitas (generosity). Roman elections were often won on the strength of free food, drinks, entertainment, and sometimes hard cash offered directly to voters and financed by private fortunes. In fact, Roman campaign slogans were sometimes inscribed on the bottom of commemorative wine cups—you could drain the cup and find out whom to vote for. Most of the Roman elite relied on the gentleman’s agreement that the line between bribery and generosity would not be strictly patrolled. At worst, rank vote-buying was something your opponents engaged in; you, on the other hand, were simply being a good neighbor. That explains the curious fact that continually rising penalties for corruption had almost no deterrent effect. Toward the republic’s end, the penalty for ambitus had risen to 10 years’ exile. The general Pompey, who presented himself as a clean-government advocate when he wasn’t buying elections for his allies, even proposed raising the statute of limitations for corruption charges to two decades, meaning that virtually no Roman politician would be safe. Yet the money continued to flow: Politicians able to afford the massive bribes were usually able to afford protection after the fact. Worse, with no enforceable limits on spending and a heavy premium on one-upsmanship, the price of elections skyrocketed. Five years before the republic collapsed, Cicero made an astonishing claim: The wealthy had injected so much cash into election season that the interest rate in Rome temporarily doubled. Nor could the power of money be confined to election season—its influence spread throughout the republic’s government. Rome had long sent politicians to govern a province after their year in office; ultimately, they felt entitled to fleece those provinces in order to recoup their election losses, a practice that spread deep resentment of the capital. The biographer Plutarch records bribery of civil servants, who were paid off to erase debts owed to the public purse. Jury verdicts, too, were regularly bought and paid for. Julius Caesar, who brought the republic to an end, walked a path to power paved by charisma and military accomplishments—and his mastery of Roman campaign-finance practices. He won his first election to Rome’s highest office with the backing of a single wealthy donor (who, in exchange, planned to serve beside Caesar). And if there was a moment when civil war between Caesar and the conservative Roman Senate became inevitable, it was probably the day Caesar paid off the debts of Gaius Scribonius Curio. Curio, an up-and-coming conservative, had won election as a tribune of the people, and with it the tribune’s power to veto any law. But he had heavily indebted himself along the way. Caesar satisfied his creditors, but only on the condition that Curio switch sides. From that point, Caesar, who already had an army, owned a veto in the Roman government. Political deadlock was assured. Caesar’s fiercest personal enemy was also Rome’s most consistent enemy of electoral corruption. Marcus Porcius Cato, a Stoic and Senate conservative, made his name denouncing the influence of money on private and public life. Yet Cato failed, just as other would-be reformers did. He obsessively cast corruption as a failing of personal morality rather than a systemic crisis, which dramatically understated both the scope of the problem and the means needed to control it. As a result, Cato’s proposed remedies were usually ad hoc, and they predictably fell short. On the day of the election, Cato stood before the Roman people and duly announced that one of the candidates had cheated. The rivals huddled and came to their own decision: The guilty man should be let off with no further penalty, and he should keep his money. That’s how deep corruption ran in the culture of the Roman elite. Even as ambitus weakened the republic, each member of the governing class preferred a strategy of maximizing his own gains in a broken system. Vote-buying made sense for individual politicians at the same time as it undermined the elite as a whole. Cicero, for instance, passed a strong anti-corruption law and even named it after himself—and then, he secured the acquittal of the very first man charged under the law because he was a political ally. Several years later, an ex-governor was tried for extorting money from his province to finance a campaign for higher office. Six different lawyers, drawn from the cream of the Senate—the equivalent of a Roman legal Dream Team—rose to defend him. The corrupt former official was acquitted with ease. By the end, chronic election-buying had helped grind down all faith in republican government. Why was Caesar able to dissolve the republic and set Rome on a course to one-man rule? Because, in large part, enough people believed that the republic was too rotten to be worth saving. And while most classical sources dwell on the aristocracy, there’s also strong evidence that ordinary Romans grew increasingly alienated from politics during the final years. Radical leaders like Catiline and Clodius drew massive followings with their attacks on a corrupt elite; their riots, in turn, helped convince much of that elite that Rome was in grave need of a strongman. Unlimited money in politics certainly doesn’t guarantee riots and civil war. Nor does “the appearance of influence” always undermine republican government. But legitimacy matters, and it rests on a delicate understanding: the belief that those who govern have a right to govern. It’s devilishly hard to measure or quantify, but (to paraphrase the Supreme Court again) we know it when we see it. How much democratic faith do Americans have today? How many liberals think George W. Bush won in 2004 because of electronic voting shenanigans in Ohio? How many conservatives think Barack Obama won in 2008 thanks to ACORN, or in 2012 because of handouts to the 47 percent? Unlimited money in politics adds one more cause for doubt, perhaps the most powerful of all, to a list that has grown in recent years. How long until we have a presidential election in which a dangerous percentage of Americans view the final result as illegitimate on account of money? On some level, Citizens United was right. It’s not bought influence that’s deadliest to our politics—it’s the appearance of influence. We can debate dueling First Amendment readings and the real power of super PACs all we’d like; but here is a case where public opinion, on its own, should be decisive. If a loss of faith becomes wide and deep enough, the question of whether or not we are right to lose faith becomes academic. The loss is destructive either way. Just ask Rome.